I don't think this set of minis I got from Icing have names. 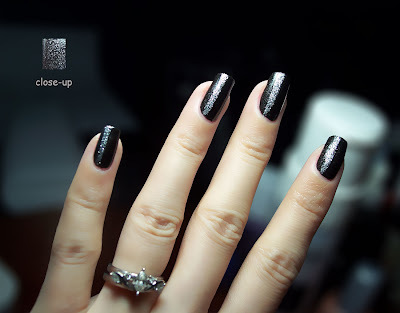 It was a set of 5 colors with microglitters, the one I tried was black. It was looking blah so I threw in an offset silver stripe for some umph! I was up very late last night and did this after work when I was super tired so I didn't bother to take any good pictures, sorry. I think once this comes off I'd like to try drawing my puppies on my nails. Your corgies? Omg that would be so cute! Seems challenging, but maybe not for you! Pretty! I love that stripe, it adds dimension to it. Can't wait to see the Corgi mani! omg i love it! looks so classy!